It’s a question that’s posed almost as often as When was “The Greenbrier built?” (1913) and “Is it true there was an underground bunker here?” (absolutely, and tours are given daily). The answer: It’s a little more complicated than the construction and bunker queries, mainly because there is no perfect answer. There is no bad time to make a visit to The Greenbrier, with each season offering guests unique experiences and special events. 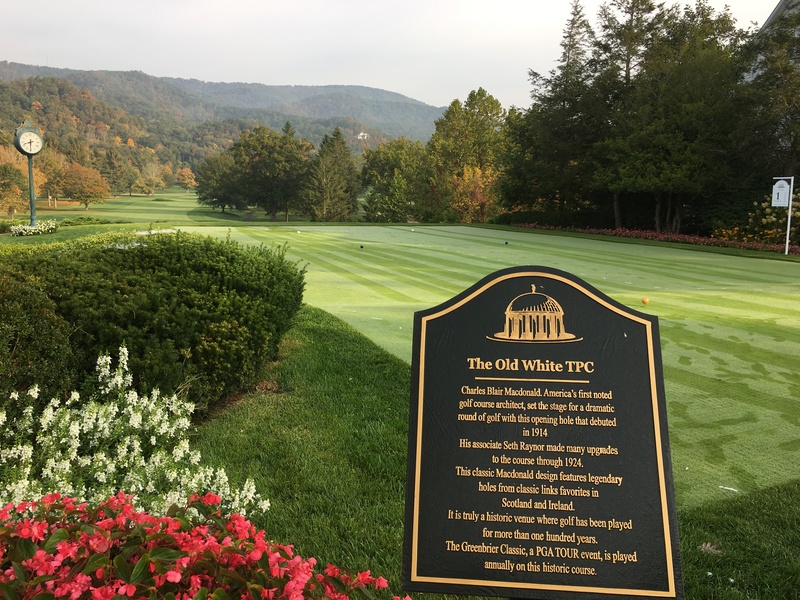 When the autumn colors begin to pop on The Old White TPC and all over Kate’s Mountain, The Greenbrier’s 11,000 acres create a backdrop that no artist could put on canvas. But it’s not just the breathtaking scenery that makes America’s Resort the place to visit in the fall. It all starts a week before the calendar officially turns to fall with The Greenbrier Champions Tennis Classic, the annual tennis showcase at the picturesque Center Court at Creekside Stadium. This year’s event, which will be held Sept. 15 and 16, features two of the game’s biggest stars in sisters Venus and Serena Williams. Current men’s stars Marcos Baghdatis and Kevin Anderson will also take part in the event, along with two legends to be announced at a later date. The two days of tennis will include men’s singles, women’s singles, legends singles and mixed doubles, along with autograph sessions and other special events. For more information, visit Greenbrier.com/TennisClassic. The fall season comes to a close with Thanksgiving Weekend, Nov. 22-25, which includes a Thanksgiving Day Feats, the annual Gobbler Gala, family scavenger hunts, painting workshops wine tastings and much more. In between those two signature events, fall provides the perfect opportunity to hike through The Greenbrier’s nature trails, enjoy comfortable temperatures and amazing scenery on the golf courses, take a ride on horseback or in a Polaris RZR or simply sample some of the tastes of the season inside The Greenbrier’s award-winning restaurants. Whether you prefer sitting by a roaring fire with a glass of wine while the snow falls softly outside the windows, or getting out in the elements and enjoying the sports of the season is more your speed, Wintertime at The Greenbrier is a magical experience for the entire family. The Greenbrier’s 60 Days of Holiday Cheer officially begin on November 4, and the celebration of the season really heats up at Thanksgiving. During 60 Days of Holiday Cheer, America’s Resort is illuminated with thousands of lights and decorations, and festive music fills the lobbies and hallways. Tree lightings are held each Saturday night between Thanksgiving and Christmas, brining Santa Claus to town to light up The Greenbrier while guests sing their favorite carols and sip on hot chocolate. Christmas includes feasts, music and celebrations, and there’s no better place to ring in the New Year than inside one of the grand ball rooms at America’s Resort. The Greenbrier has New Year’s Eve events for every age, and New Year’s Day begins with a scrumptious buffet to start the year off right. But it’s not just the holidays that bring guests from all over the world to The Greenbrier during the winter. January through March are also excellent times to visit. Shuttles to nearby ski resorts, an ice skating rink on property, sleigh rides and off-road excursions give guests a chance to enjoy the winter weather. Inside, fires roar and activities abound. Special programming like comedians, magic shows and wine dinners fill up the calendar, and movies, bowling, the escape room and other indoor activities are perfect for those who want to stay entertained while enjoying the warmth of the resort. If you think The Greenbrier is beautiful when it is covered in a blanket of snow, wait until you see it decorated with the vivid colors of spring. Easter Weekend, April 19-21 in 2019, kicks off the spring season. A tradition more than a century old, Easter at The Greenbrier includes a Sunday service, brunch, egg hunts, magic shows, lawn games and much more. May 3-5, The Greenbrier Concours d’Elegance will be back at America’s Resort for the second year. This unforgettable weekend for auto enthusiasts includes scenic drives through West Virginia’s back roads and the judging of 100 of the United State’s finest collector cars. Treat mom to an experience that will show her what she has meant in your life with Mother’s Day Weekend at The Greenbrier May 10-12, 2019. The third annual Greenbrier Half-Marathon will be held on May 11, giving runners a chance to run along some of the country’s top golf courses with breathtaking views of the Allegheny Mountains and a special brunch to follow. Memorial Day at America’s Resort brings the spring to a close and welcomes in the summer. Whether sipping cocktails by the pool or participating in a tennis tournament, Memorial Weekend at The Greenbrier provides both the relaxation and the entertainment you are looking for to welcome summer’s arrival. Travelers have been escaping the summer heat with trips to the West Virginia mountains since 1778, and not much has changed. Summer at The Greenbrier is filled with activities to be enjoyed by families, couples, groups or businesses. Fourth of July weekend includes scavenger hunts, games, golf cart parades, picnics and fireworks, and it’s followed by The Greenbrier Classic, the annual PGA TOUR FedExCup stop at America’s Resort. Labor Day weekend will bring the summer to a close with mixology classes, wine tastings, music and much more. In between, guests can enjoy the outdoors with hikes, off-road excursions, tennis, golf, croquet, swimming, the gun club, falconry, fishing and many other activities for guest searching for all levels of adventure. The Houston Texans will be at The Greenbrier Sports Performance Center for nearly three weeks of Training Camp beginning July 25, giving football fans a chance to see some of the best athletes in the game as they prepare for the upcoming season on the gridiron. With a history dating back to 1778, a world-renowned spa, some of the best golf in the world, retail shops of all varieties and more than 55 indoor and outdoor activities, there is no wrong time to visit America’s Resort. Each season offers its own unique opportunities, and The Greenbrier’s beauty, as well as the hospitality of its nearly 2,000 team members, is on display any time of the year. Book your visit now and experience Life As Few Know It at The Greenbrier. Cam Huffman is the Director of Public Relations and Content for The Greenbrier. Have you played America’s first-ever golf course?